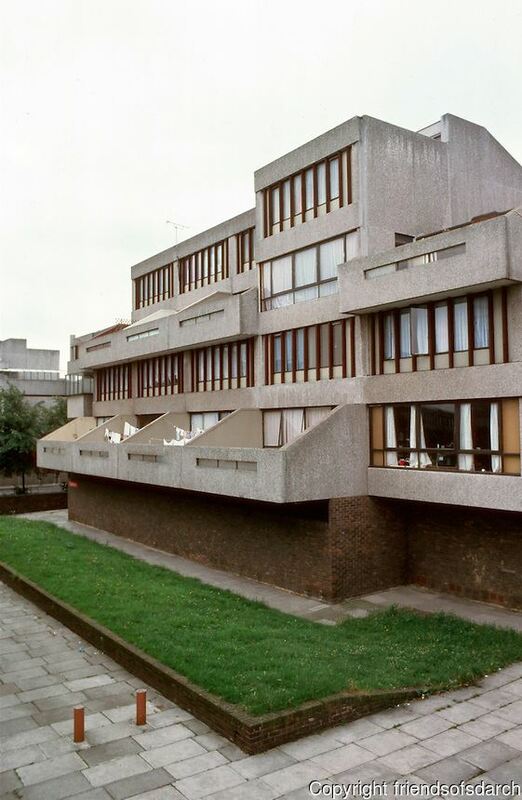 Housing association Peabody have recently undertaken consultation on plans to rebuild much of the iconic Thamesmead estate. A large amount was demolished a few years ago, including the town’s shopping and community centre at Tavy Bridge, where former landowner Gallions planned to build a tower at the newly named ‘Southmere Village’. Since then progress has been glacial. Peabody, a far larger group, announced in May 2013 they would ‘merge’ with Gallions, though in reality it was more of a takeover. Two and a half years later and re-worked plans have been revealed, with work by Proctor & Matthews alongside Mecanoo architects. It’s interesting to see how similar some elements of the plans are to the original scheme drawn up in the late 1960s. 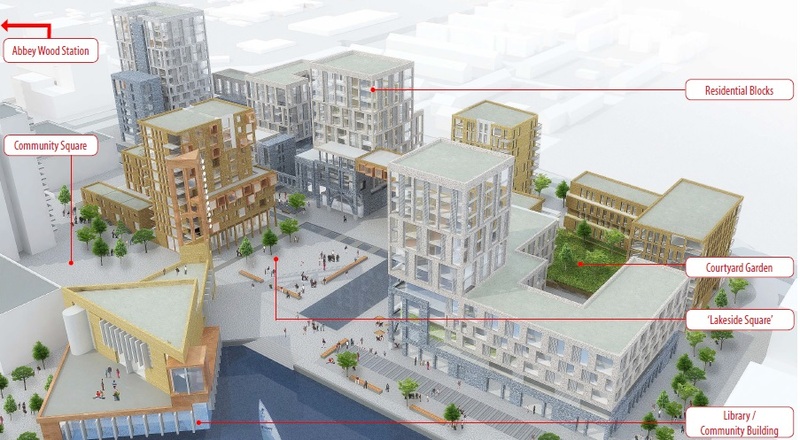 Plus, much of it appears similar to Gallions’ plans, which I covered about three years ago. It’s hard to escape the feeling that by the time this begins, four years would have been wasted whilst housing is desperately needed and the local shopping parade has been reduced to rubble. The local library has also been moved 500 metres away from much remaining housing to a poorly accessible location, hidden below a dual carriageway in porta-cabins. The building it vacated a couple of years ago still stands, as the scheme has dragged along. At first glance the fundamentals of these new plans seem similar to both the original Tavy Bridge area and Gallion’s previous ideas. Both Gallions and Peabody’s plans feature a tower facing the roundabout. The old Tavy Bridge had a community building on the corner of the lake, which new plans also feature. Gallions’ plans had a public square here too, which Peabody’s also include. Tavy Bridge similarly had a public space, though located above car parking. When constructed, Thamesmead adopted the model that surrendered much of the street level to cars. Firstly, this was due to wider planning policies that were popular at the time, as car ownership rates were rising and ideas of streets in the sky, on walkways and bridges, were popular. This could be seen at numerous post-war estates. The Aylesbury and Park Hill at Sheffield are famous examples, but the City of London also pushed it, most famously around London Wall. This led to separation of cars from pedestrians, who would happily walk above on walkways. They generally didn’t, as it was often more convoluted than dodging cars at street level. 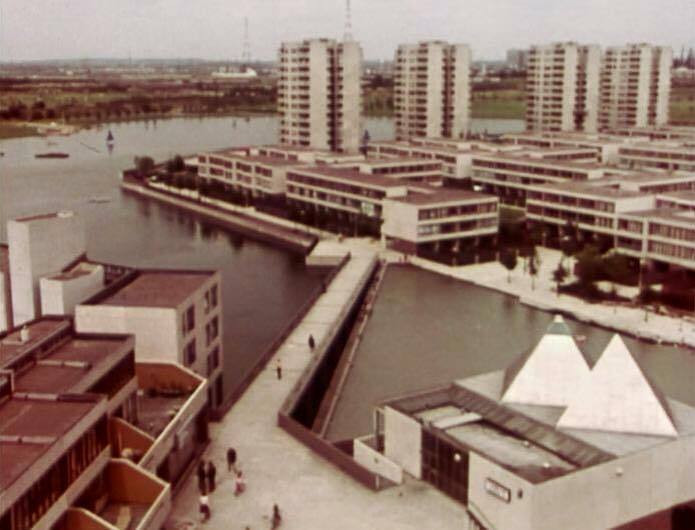 Secondly, and something which was specific to Thamesmead were the laws preventing ground floor occupation, due to its location on the Thames flood plain. Now those restrictions no longer apply, it would be great to see some of the original Thamesmead estate retained and re-modelled, particularly along Harrow Manorway. Even a small amount restored and renovated would allow the link to the past to be retained, and these interesting buildings contributing to the streetscape. The housing along Harrow Manorway were some of the earliest sections, and as such are the most complex and interesting in form. Ground floors were given over to parking and entrance was by first floor walkway, but reworking could allow entrance at street level to remove the dead frontage they provide to streets. The wooden framed windows were also removed and tacky UPVC’s installed instead. It wouldn’t take a great deal to restore features such as that, whilst cleaning the concrete to a clean state, when it looked almost white. Sympathetic restoration of these features, whilst fixing the flaws of giving ground floor space to cars, could rejuvenate these buildings. In much of London they would be restored and cherished as some of the best examples of post war housing design. The proposed community building beside the lake would house a Bexley Council library. This would be only a five minute walk from a new Abbey Wood library which Greenwich council last week approved moving beside Sainsbury’s on Harrow Manorway. The borough boundary runs down the middle of that road. Neither council appears to talk to the other. Abbey Wood library will be moving from Abbey Wood estate, where it is well used and serves a deprived area, plus helps bring footfall to a forgotten and neglected shopping parade, to a location close to where Bexley council have had long standing plans for a new library. Greenwich council will be paying £350k to do this. It seems a decision from Greenwich council that benefits Thamesmead residents in Bexley Council rather than Greenwich council residents. It’s the same with £6m Crossrail work. It mainly benefits Thamesmead residents by improving areas they use to walk or catch the bus from the station. Abbey Wood’s main shopping parade beside the station was almost entirely overlooked. Belatedly, a far smaller sum of £300k was obtained from the Mayor, but a large amount will be spent on consultants (about £70k of that) and guidance, and very little for the utterly crap public realm seen there. Most respondents to the online consultation undertaken over the summer and seen here highlight the ugly street, poor lighting, parking problems and want improvements. It’s not going to happen with the small sum given. It’s an odd council that focuses on neighbouring council’s residents above its own. Rightly or wrongly, it does seem to give credence to frequently heard speculation that many in Greenwich council aren’t particularly aware about what parts fall within their borough, and how it responds to neighbouring areas. No doubt the council will vociferously argue against, but there’s scant evidence to back it up. The shopping parade has huge scope for improvements. So much so that it would be worth a bid for major scheme status under the Local Implementation Plan, where the Mayor and GLA give money to councils for one big scheme each year. 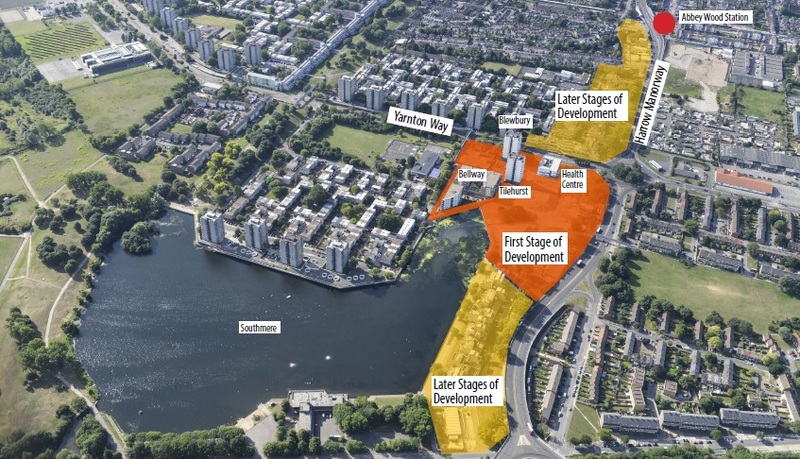 Peabody’s plans for Thamesmead will likely be submitted for planning in the first half of 2016. It’s looking likely that 2018 will see the earliest new homes complete. That’s about eight years of land lying empty despite the dire need for new housing. It in close to Crossrail’s opening however, so good timing for those houses on sale to accumulate in value to a greater degree. Following stages of the plan will hopefully not suffer such prolonged development. The site to the north is already vacant, and half the stretch along Harrow Manorway was approved for demolition by Peabody over the summer, with notices now being served to residents. 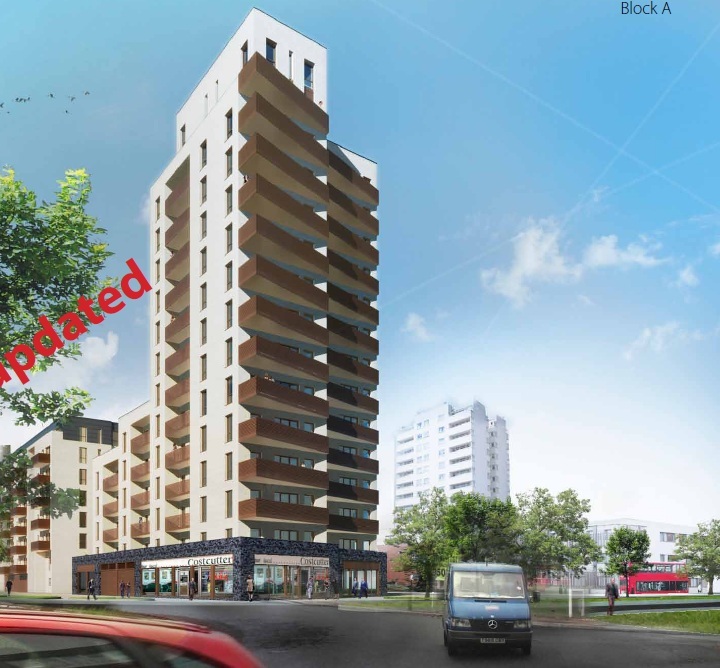 We were unable to go to the viewing of the local redevelopment in Sainsbury’s Abbey Wood last week. However a neighbour in our road did and he was told that negotiations were not only underway to purchase the four houses (with the shops, on the end of our road (Overton) but also that they were negotiating with the owners of the block of the next four 1930’s properties directly within our road also. 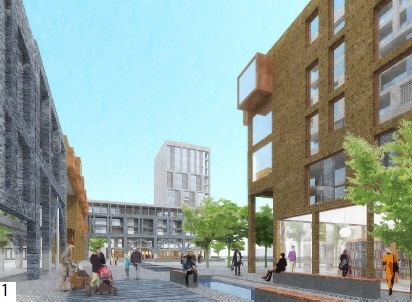 The plan you have shown confirms what you always suspected about the – eventual – redevelopment where the small business units are in Harrow Manorway. The yellow blocked area covers that and the petrol station. As Peabody are doing this in conjunction with LBB I’m wondering if the council will be issuing compulsory purchase orders to any reluctant sellers. Presumably this would just be for land value. It’s an odd council that focuses on neighbouring council’s residents above its own. The clique who run Greenwich are obsessed with getting one over on Bexley, so will be more than happy to be operating a library in competition with them. And of course, Bexley are no fans of Greenwich, either (the proxy war here is over parking in New Eltham). They’re both as bad as each other.